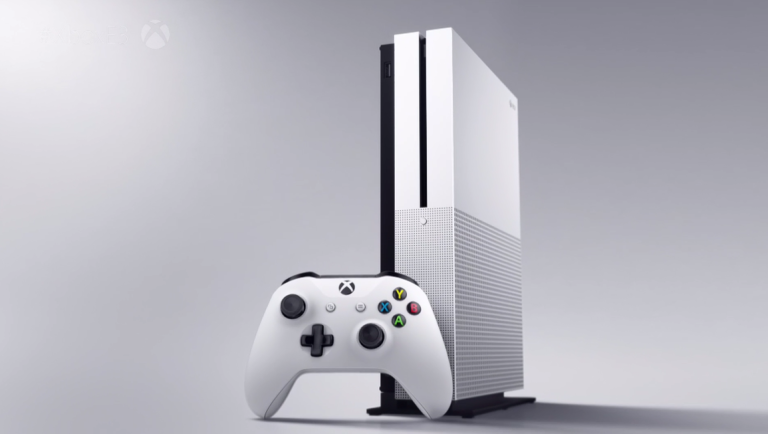 Microsoft kicked off the show with a bang and went straight to the hardware, revealing the much rumoured and leaked slimline XO, the Xbox One S. Coming in a sleek Robot White (just like the larger version that shipped with Sunset Overdrive), the XOS is 40% smaller and will support HDR (High Dynamic Range) gaming - this basically means more colours and detail on-screen. The console will come with a 4K-ready player and support Blu-ray playback, making it ready for the new era of home entertainment. It does away with the power brick the Xbox has been lumped with for years and can be stored vertically thanks to a new stand. There's an in-built IR blaster and a USB slot at the front for easy flash drive access. The console doesn't have a port for Kinect (one more sign Microsoft is cutting its losses with the failed two-generation peripheral), but will come with a new version of the standard Wireless Controller. The new pad features brand new grips, a longer range on that wireless functionality and the addition of Bluetooth. It's due to arrive in August for $299 (£210). Xbox One S vs PlayStation Neo - which will win the next round? Next, the Coalition took to the stage to show off the co-operative features of new series instalment, Gears of War 4. The game will have full Cross Platform play between Windows 10 and Xbox One users, a feature that will carry across all multiplayer modes, Horde mode and the co-operative story campaign. Gameplay was very Gears in its basic premise (run like a roadie, take cover, shoot some foes, nail an active reload and jump in for some bloody melee combat with your Lancer), but some of the new areas - including a site racked by a vicious sand storm - led to some interesting dynamic set-pieces where players need to work as a squad to cross gaps and eliminate enemies. The lighting looked particularly good. Oh, and an old, grizzled Marcus Fenix also made an appearance. The fan boys went wild. There will also be a Gears 4 branded Elite Controller as well. Nice. Microsoft announced its new Play Anywhere feature - the general gist is an digitally-purchased titles can be played on both Windows 10 and Xbox One with a single purchase (providing said games support both platforms) with saves and achievements shared across both. With most of the titles on show now coming out on Windows 10, it's clearly a scheme Microsoft has been pushing hard with devs. Killer Instinct, the digital-only revival of the classic Rare fighter has had a few cameo characters that have gone down surprisingly well with fans, namely The Arbiter from the Halo series and Rash from Battletoads. Now, the rest of the murderous KI family will be getting a new cameo fighter - General Raam. You might know him as that giant locust dude you fought on the train at the end of the first Gears of War. He's huge, he's a badass and he's probably going to stomp Rash into a puddle. Another game leaked mere hours before the Microsoft show, the latest addition to the Forza series, open-world spin-off Forza Horizon 3. Set in a huge Australian sandbox, FH3 looks to dwarf the Italy-based FH2 in more than just size of map but in features too. Players will know be able to team up with other players or friends and merge their gameworlds into one, seamless setup. Think The Crew but a game that's actually worth playing. With everything from lush forests and urban cityscapes to dusty outback trails and gorgeous sun-baked beaches, this looks to be the most diverse Forza Horizon yet. It's also coming to Windows 10 for the first time. It will arrive for Xbox One and Windows 10 on 27 September. We were also treated to a live demo of Final Fantasy XV, with a special E3 mission, 'The Trial of the Titan'. The mission, which saw chiseled main character Noctis attempt to fight a mountain-sized titan while waiting for his equally-chiselled friends to arrive for a sight to behold. We got to see plenty of Noctis' moves, including a blue-tinged phase shift that will help to pass through unblockable enemy attacks. There was even a couple of QTEs, but it was so much fun you'd barely notice. Definitely one of the best highlights of the night. It also marked the first time we'd seen gameplay demoed on an Xbox stage. Next, Microsoft revealed a slew of new features coming to Xbox One. For a start, you'll soon be able to use your own background music, enabling you to create your own bespoke soundtracks. There's also the introduction of three new types of social structure coming to Xbox Live - Clubs, Groups and Arena. Clubs is for connecting to people that share your interests; Groups is objective orientated, creating a pool of players trying to beat certain games (think the Dark Souls summoning system); and finally there's Arena, which will offer tournaments and championships for extra competitive players. Oh and there's also a Design-Your-Own Xbox One Controller Program - Microsoft is promosing 8 million combinations of garish colours. Another leaked game made official by a pre-rendered trailer, Capcom is bringing back its undead open-world with Dead Rising 4. Fan favourite Frank West returns and this time it's set at Christmas! No actual gameplay, but by this stage we know what we're getting with a Dead Rising game: crazy weapon combos, terrible bosses and zombie mayhem to the max. Sea of Thieves - the first-person pirate MMORPG from Rare - got a small gameplay trailer showing everything from getting drunk with grog to exploring desert islands. Controlling ships will take players working together two - one steering, another on lookout, another on cannons, etc. It looks lkke great fun, but it'll take more than a nice video to prove the concept can work in reality. We're really optimistic, though. Keiji Inafune's new game (that isn't late and crowdsourced - *cough* Mighty Number 9 *cough*), ReCore got a great reception. It's a 3D platformer of sorts, with the focus on a relationship between a girl and her robot companion. Devs who have worked on everything from Halo to Metroid Prime are working on the project, so it's definitely one to watch. Scalebound, the new game from Platinum Games will feature co-operative gameplay and huge bosses - one of which was definitely a giant enemy crab attempting to inflict massive damage. This looks like a world away from the licensed trash Platinum has been pumping out of late, and a harking back to the glory days of Bayonetta. Halo Wars 2, which is being developed by RTS specialist Creative Assembly, starts its beta today. Microsoft also showed off some new gameplay, teasing us with bigger battles and a more fluid UI to control and deploy your Covenant or Spartan troops. It's due to arrive in February next year and is one of the few true RTS' being made for consoles. State of Decay 2 is also a thing - the original ended up being something of a cult hit on Xbox 360, with its focus on stealth, sound and survival in a zombie apocalypse. The sequel seems to be pumping up the co-op aspect, although it does seem to have taken on a more tongue-in-cheeek feel a la Dead Rising 4. Zombie are still cool, right? Gwent, the brilliant in-game card game first featured in The Witcher 3, is now getting a standalone version. Fantasy franchises getting their own CCG tie-in seems to be a popular thing these days (Hearthstone, Chroncile: Runsescape Legends, The Elder Scrolls: Legends, etc), but Gwent is a bit more complicated and very rewarding so we're looking forward to seeing Gwent give the proper limelight. Tekken 7 is still coming, even though it's taking its time. And while Tekken X Street Fighter seems dead in development hell, we did get to see the spirit of it live on we a pre-rendered/actual gameplay fight between Tekken's Heihachi and Street Fighter's Akuma. It was pretty epic, but we're wondering whether Akuma is just a cute extra character a la Scorpion in Injustice: Gods Among Us. In something of a smoke and mirrors reveal, Microsoft made another of its hardware reveals - the heavily rumoured super Xbox. Codenamed Project Scorpio, the full details behind the console are still under wraps but we did learn a few things about it. It's going to support a number of VR headsets, will run games at a native 4K.